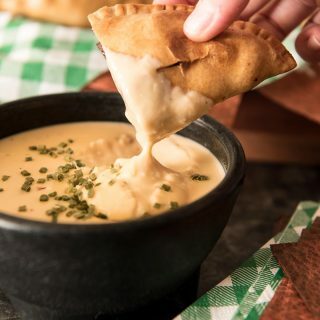 A fabulous street food mash-up served with a gooey beer cheese dip! 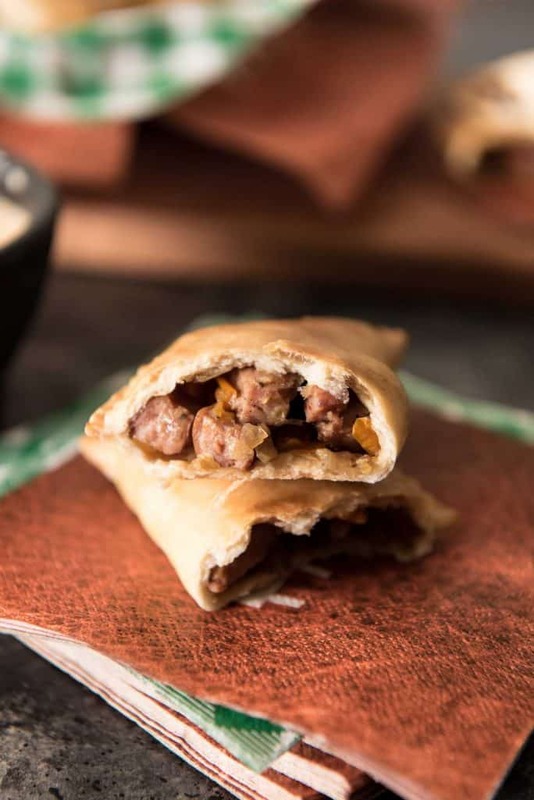 Delicious smoked sausage, peppers, and onions, stuffed in pastry discs make these Smoked Sausage and Peppers Empanadas perfectly portable and mess free! This post has been sponsored by Eckrich. All thoughts and opinions are my own. Thank you for supporting the brands that make this blog possible! Who doesn’t love a little street food on a weekday, huh? Today, we’re talking about two of the most delicious meals that can be found on the streets of most major cities – but combined in one ultimate snack. You don’t need a bib for these babies, though! 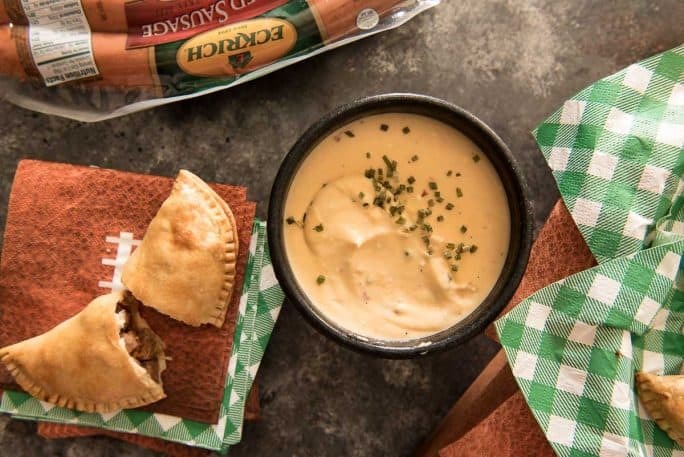 They’re perfectly portable, and are about to be your most requested game day food! JUST TAKE ME TO THE SMOKED SAUSAGE AND PEPPERS EMPANADAS ALREADY! 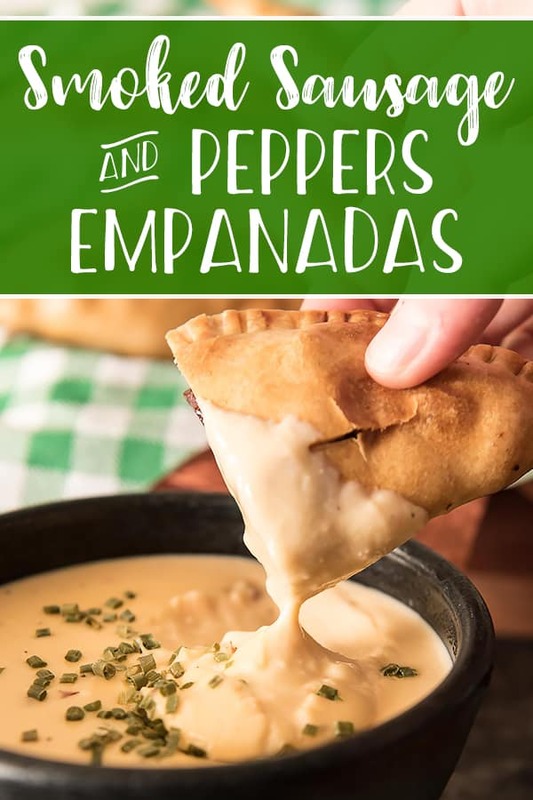 If you’d rather skip my (pretty darn helpful) tips and tricks, essential cooking info, and similar recipe ideas – and get straight to this deliciously easy empanada recipe, just scroll right on down to the bottom of the page where you can find the printable recipe card! Italian sausage & peppers has been and will always be one of my go-to sandwich options. There’s something so comforting about a toasty bun filled with juicy sausage, caramelized onions, and tangy peppers. When the fair comes to town in the fall, or I find a food truck with them on the menu, I default and order one. Can’t help myself. Do you know what’s even easier than Italian sausage, but just as delicious? Smoked sausage, which is something we always always have on hand. Breakfasts in our house often consist of eggs, toast, and some kind of protein, because Abe is very much still a caveman. We don’t always have bacon thawed out, but we usually have a package of Eckrich Original Skinless Smoked Sausage in the fridge ready to go. I’ve been playing around with recipes for tailgating lately, even with football season wrapping up. It’s always good to get ahead of the game (no pun intended) for the following year. Abe has been part of a Fantasy Football league for the last few years, and I’ve used Sundays as an opportunity to test my recipe creations on our friends. 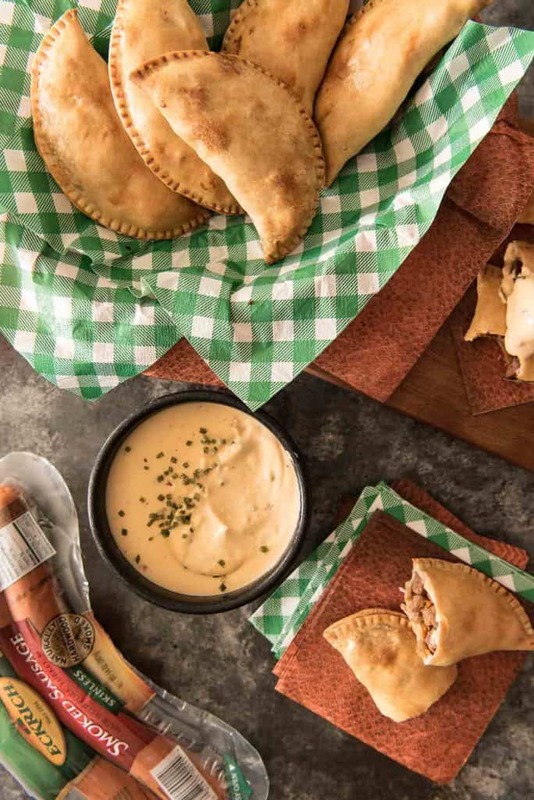 These Smoked Sausage and Peppers Empanadas are a mashup of that delicious sandwich and one of his favorite football snacks – and needless to say, they’ve been a hit! 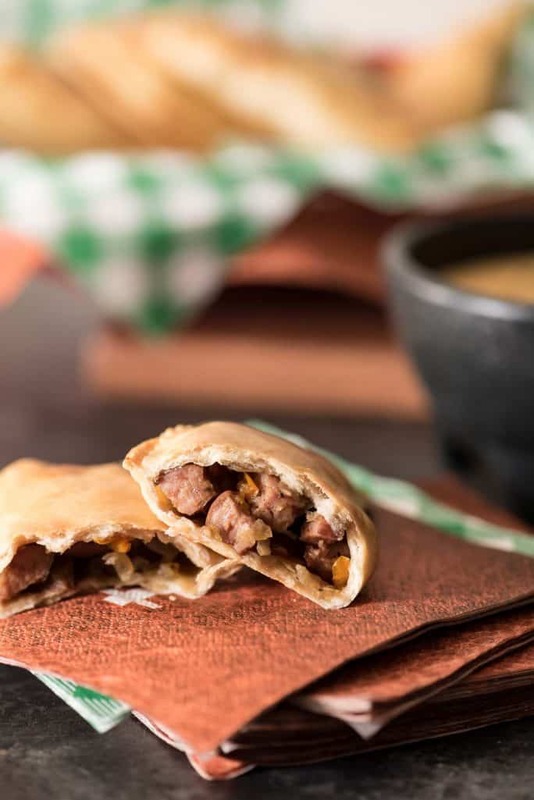 The flavors are a little of this and a little of that – not quite a sausage & pepper sandwich, not quite a classic empanada, but very smoky and tasty. They’re so versatile and easy to customize, too. You can add any extra spices you want and it will only enhance the flavors of the already high-quality hardwood smoked sausage. They’re so easy to throw together, too, and can be made en masse in advance and refrigerated until you’re ready to bake ‘em for your crowd of hungry football fans. 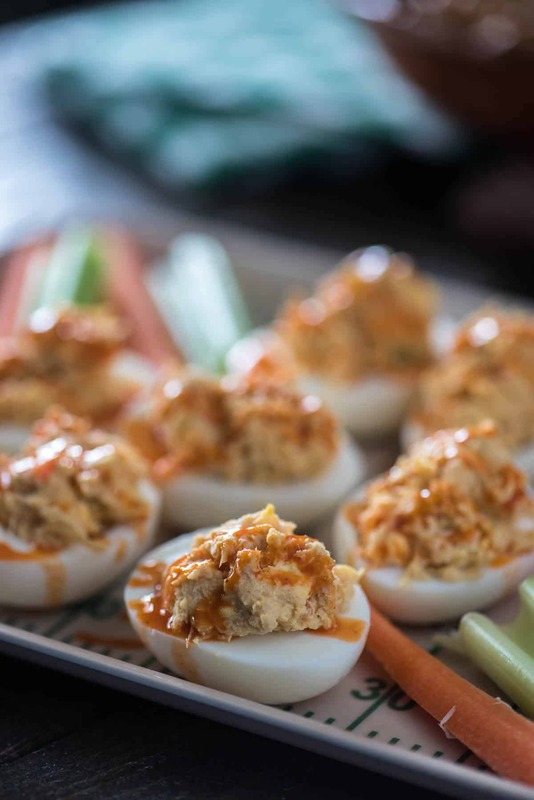 LOOKING FOR MORE TAILGATING APPETIZER RECIPES? Place the sausages in a large skillet over medium heat, and brown on all sides. Remove from skillet, slice in quarters, then chop into small chunks. Melt butter in skillet. Stir in the onion, and garlic, and cook 2 to 3 minutes. Stir in bell pepper and season to taste with salt, peppers, and oregano. Stir in beer and simmer 5 minutes, or until the vegetables are tender. Return chopped sausage to skillet with the vegetables. Reduce heat to low, cover, and simmer 10-15 minutes, or until sausage is heated through and vegetables are cooked. Drain liquid from mixture in a large, fine-mesh sieve. Preheat oven to 375 degrees F.
Place empanada discs on work surface. Using heaping tablespoon measure, spoon mixture onto center of dough round. Using your finger, paint the outer edge of the dough with water. Fold dough into half-moon shape; gently press down edges and use the tines of a fork to seal. Repeat with remaining ingredients. Divide empanadas among baking sheets. Brush tops of empanadas with egg wash. Cook until pastries turn golden brown and filling is hot, about 30 minutes. In a small saucepan set over low heat, melt the cream cheese. Add the shredded cheeses and beer, stirring consistently until melted. Stir in the liquid smoke, then season as desired with salt and pepper. Keep on very low on stovetop until ready to serve - this cheese thickens quickly. PIN THESE SMOKED SAUSAGE AND PEPPERS EMPANADAS FOR LATER! 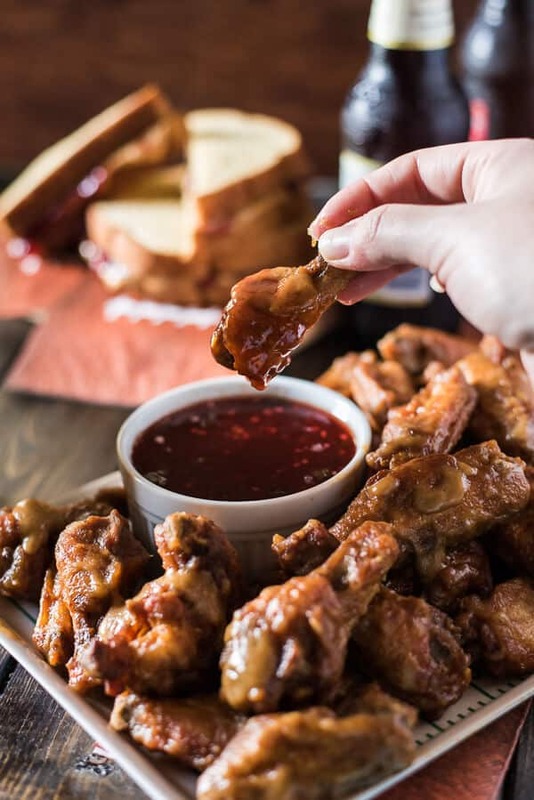 Serve up a few of these other perfect tailgating snacks this football season! Thanks for reading my post sponsored by Eckrich. These are one of my favourites. Lovely presentation and yummy recipe. Pinned. With beer cheese?! Get in my belly! These look super tasty! I am craving your smoked sausage stuffed empanadas now!! It’s dinner tie here, I shouldn’t have been introduced to these babies now. I wish I could get that smoked sausage here, it does look interesting. I would make your empanadas right away! 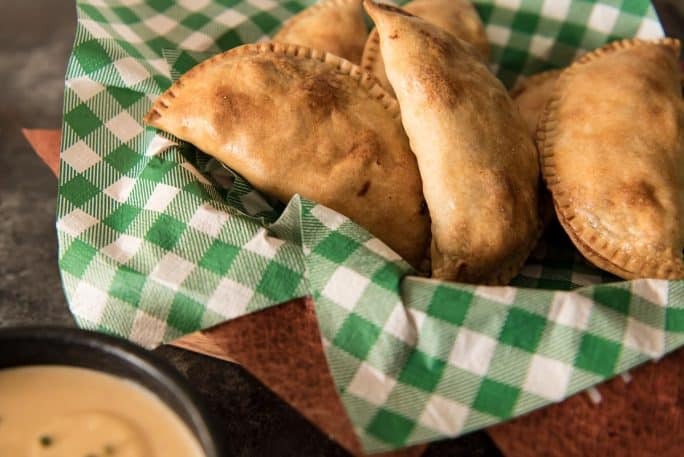 Love your empanadas, they look like little packages of culinary goodness. I like how you baked them, great idea! Oh I love empandas and have not made them in ages. This makes me wanna go to the kitchen and make some. yum. 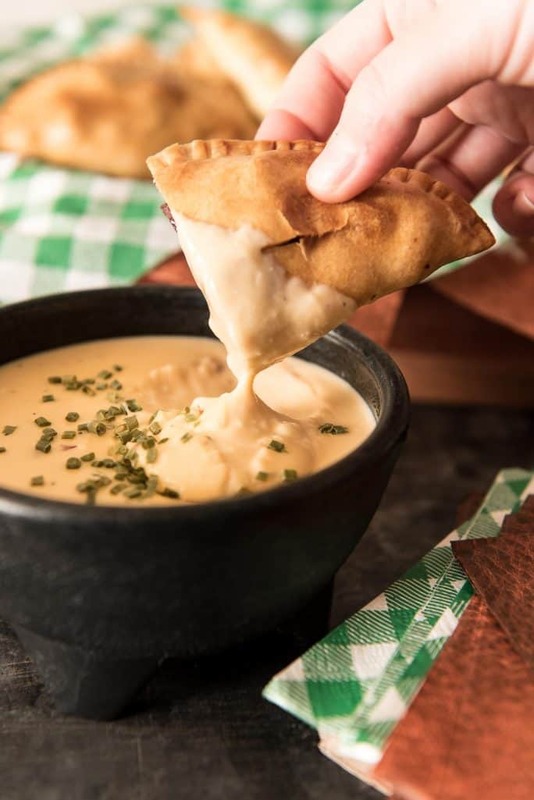 First you have these delicious empanadas then you did them in beer cheese – oh yum!!! Those certainly look tasty! I don’t know if I could stop eating them. It’s been a very long time since I’ve had an empañda and your looks better the the one I had.